Ukraine is not going to put up with the actions of Russia against the Ukrainian churches in the occupied territory. President of Ukraine Petro Poroshenko demands from the Russian Federation to stop actions against the Ukrainian church in the temporarily occupied Crimea, the press service of the Ukrainian guarantor reports. 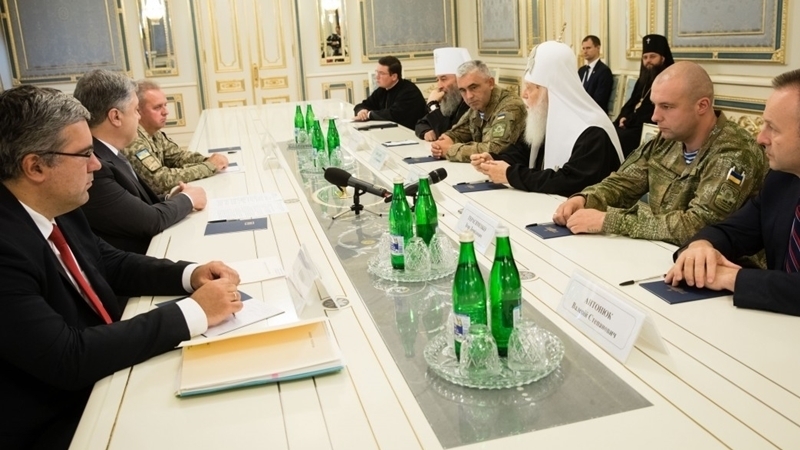 The demand to stop attacks on the Ukrainian Orthodox Church of Holy Equal-to-the-Apostles princes Olga and Vladimir was announced during the meeting of the President with representatives of the church and heroes of Ukraine. “We (...) should defend the Ukrainian church, which was recently attacked in the occupied Crimea. We are not going to put up with this, nor accept it. And we demand to stop any actions against the Ukrainian church,” Petro Poroshenko stressed. Previously, on August 31, Russian special services officers blocked the Ukrainian Orthodox Church of Holy Equal-to-the-Apostles princes Olga and Vladimir in occupied Simferopol. The Kyiv Patriarchate stated that the Russian security officials had damaged the premises, broken doors and altars, confiscated some of the church property, and also blocked the access to the church for parishioners. During the forceful actions special services officers injured his hand of Archbishop of Simferopol and Crimea Kliment.